Troy and Deana, you are now taking into your care and keeping the happiness of the one person you love the most. You are agreeing to share strengths, responsibilities, and love. As husband and wife you will be each other’s best friend, confidant, lover, teacher, listener and protector. As your relationship grows it will deepen and enrich every facet of your life. Your happiness is fuller, your memories fresher, and your commitments will be stronger. You will indeed experience marriage to be one of life’s greatest commitments, one of life’s greatest blessings, but also one of life’s greatest challenges. So, be mindful of this; that every effort to preserve love with one another, by demonstrating patience, by holding each other gently, and by lifting each other up, will go a long, long way in guaranteeing a wonderful and happy life together. The Grand One is the only yacht on Disney property that can be rented for day trips or private events. The evening began as we meet the couple at the Disneys Grand Floridian Resort Marina. The Captain of the Grand One greeted us and was highly attentive to the couples needs throughout the cruise. In fact, Troy and Deana specifically asked the Captain to position yacht to face Magic Kingdoms Cinderella’s Castle. The interior of the yacht was decorated with rose petals and champagne. Once we arrived at the castle the ceremony took place on the back deck. 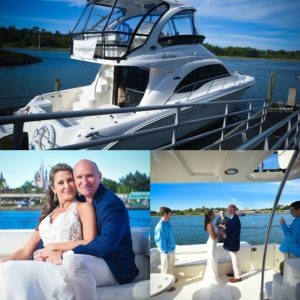 Troy and Deana declared their vows on a day filled with bright blue skies and refreshing cooling winds. This intimate wedding was captured by the extraordinary talented photographer Chris Gillyard. This whole day came together in absolute perfection as the couple was radiating with happiness. All of this would not be possible without the amazing team at Intimate Weddings of Orlando.